Keep or cancel? It’s the perennial question that comes up every time your credit card’s annual fee is due. Should I pay the fee and keep the card? Should I cancel it? Or should I fish for a retention offer and base my decision on that offer? All these questions can really be boiled down to one: Will keeping this card another year be more valuable than the annual fee? The answer to that question can be determined with some simple math, although assigning a dollar value to some card benefits gets a little subjective. For example, the impact of cancelling a card on your credit score is hard to quantify. Likewise, banks have different rules on how often you can get a sign-up bonus. Keeping a card too long could hinder your future points-earning potential. You need to consider these and many other factors when you calculate the value in each scenario. Discussing all the different ways a card can provide value is beyond the scope of this post. Instead, I will use a few recent examples of keep/cancel decisions that Nicoleen and I made to highlight some of the thought processes involved. 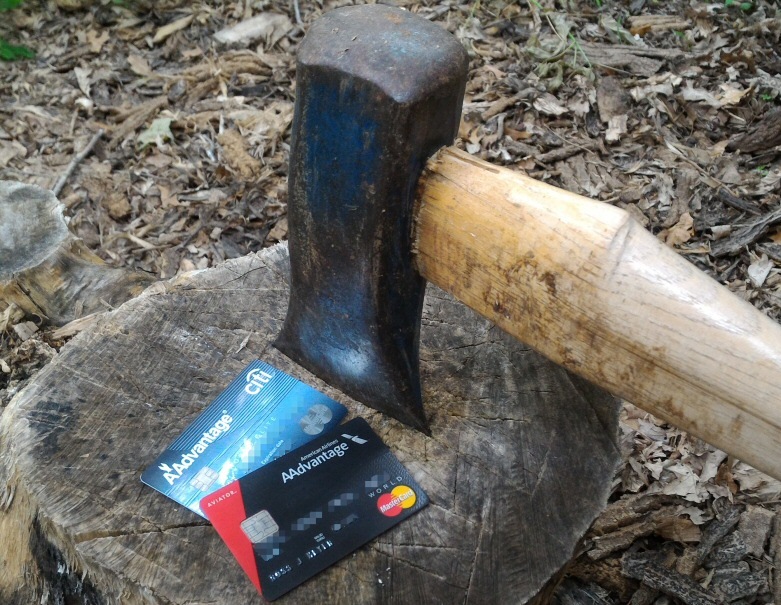 All credit cards eventually end up on the chopping block. The annual fee for Nicoleen’s Citi AAdvantage Platinum was charged on the May statement. She’s had this card for 3 years and has never paid the annual fee. The previous two times the fee was due she called and fished for a retention offer. Both times she was successful in getting the fee waived or reimbursed. We even got a few bonus miles out of the deal. Citi phone reps are pretty easy to deal with, in general. 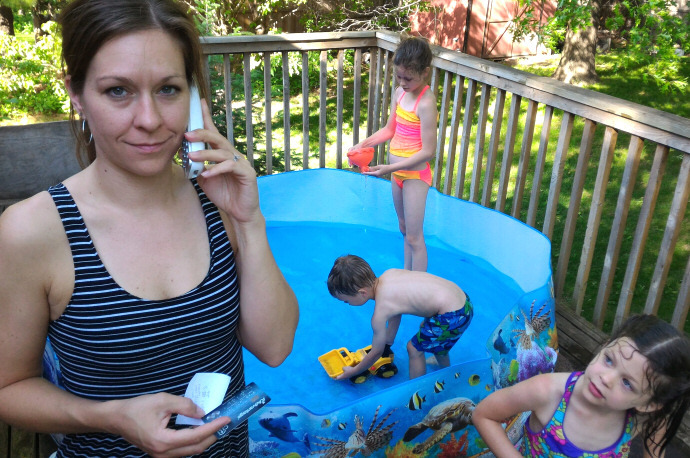 But I would still recommend finding a quiet place to make these phone calls! This was not ideal, but it all worked out in the end. This card earns American Airline miles; 1 point per dollar on regular purchases and 2 points per dollar on American Airlines purchases. The standard sign-up bonus is 30k miles with a $3k spend in the first 3 months. The fairly frequent increased sign-up bonus is 50k miles (and rarely 60k). Annual fee is $95 but is waived the first year. Historically it’s been a very easy card to get the annual fee waived just by calling. The most noteworthy fringe benefit is free checked baggage on American Airlines flights. Long before my time, this card was one of the most churnable miles cards out there. There were several card versions and each had their own sign-up bonus. Some people would open multiple cards in a year and have several accounts of the same card at once. Citi was very lax with the rules on opening accounts and getting sign-up bonuses. It was the Wild West! By the time I got in the game, a more typical strategy for these cards was thus: String along annual fee waivers in order to keep the account open for free. Doing so helps your credit score by adding to both your average account length and your credit-to-debt ratio. Some time after 24 months (Citi’s old minimum time limit between sign-up bonuses for a given card), close the account and open a new one for another 50k American Airlines miles. But recent changes have made that strategy invalid. . .
Late last year Citi dropped a bomb on credit card churners. It wasn’t quite the MOAB that Chase dropped with their 5/24 rule, but it was disruptive enough to change my strategy on Citi cards. The minimum time between sign-up bonuses is still 24 months, but it no longer applies to each specific card. The 24 month timer is now shared among all cards of a given point type. For example getting any Hilton sign-up bonus with Citi precludes you from getting the bonus on any other Citi Hilton card. What’s worse is that the 24 month timer isn’t only reset by earning a sign-up bonus as it previously was. It now also resets any time a card is cancelled or downgraded. This is nonsensical to me because it incentivizes people to cancel their cards right after getting the sign-up bonus instead of continuing to use it for the following year(s). The fact that it will be at least 2 years before Nicoleen can get any American Airlines co-branded card from Citi dominates all the other factors. Any value she would get from keeping the card, even if Citi waived the annual fee, would pale in comparison to getting that timer going ASAP. With Citi’s new bonus policy, cancelling this card was an easy decision. 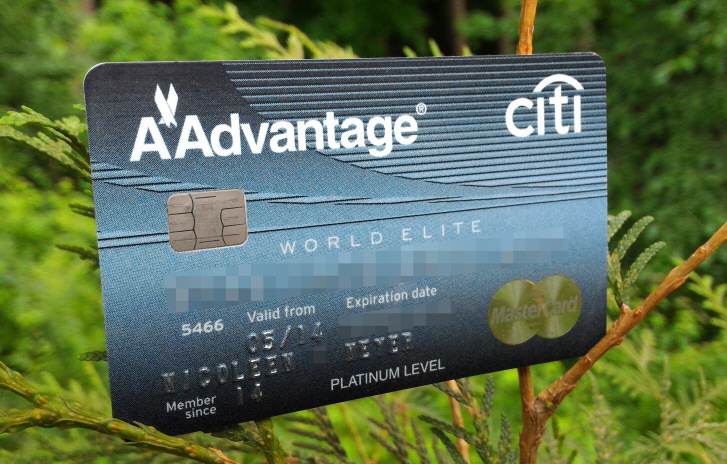 NOTE: One silver lining of cancelling the Citi AAdvantage Platinum was that Nicoleen was able to transfer the credit to one of her no-fee Citi cards. Therefore there will be no impact on her credit to debt ratio, which helps maintain a good credit score. Another American Airlines card and another history of having annual fees waived. Like Nicoleen’s Citi card, I have successfully had the annual fee waived twice on my Barclaycard Aviator Red. Usually my retention offers also came with some nice bonus miles for easy spending requirements. Last year they waived my fee, gave me 5k miles, and bonus miles on my upcoming spending. Barclay’s generosity with this card seems to be coming to an end, however. According to reports on Flyertalk, retention offers are gradually drying up. Nicoleen found this out first hand when she was offered nothing late last year. The Aviator was originally the result of the American Airlines / U.S. Airways merger. Barclay had a U.S. Airways card which was converted to the Aviator after the merger. Until recently, the only Aviator Reds that existed were grandfathered U.S. Airways cards. Now Barclay is taking new applications for the Aviator line of American Airlines cards. Current offer is for 50k miles with no minimum spend, but the $95 annual fee is not waived the first year. Notable fringe benefits are free checked bags on American, and 10% of redeemed miles refunded back every year. Other than the usual benefits of keeping a card open (credit score maintenance) the most compelling reason I had to keep this card was the frequent and generous bonus mile offers that came around. –Read about some of these in this post.– But without the annual fee waiver, the possibility of bonus offers definitely wouldn’t be enough incentive to keep this account open. As expected, when I called I got no retention offers and decided to cancel. I moved my credit to my Arrival card to minimize the impact on my credit score. 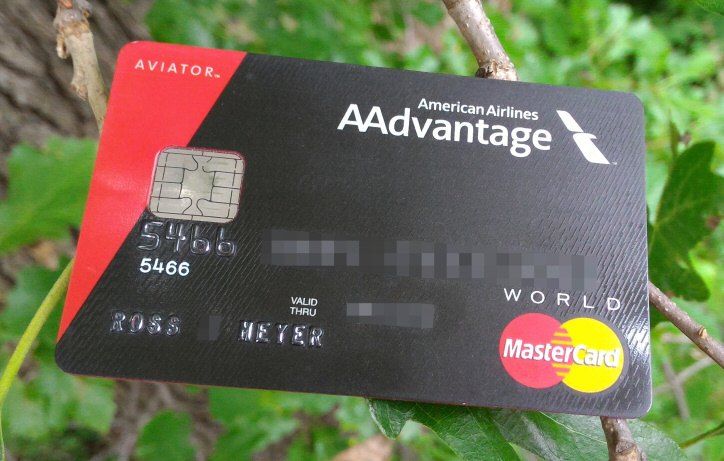 Now that the Aviator Red is available for new accounts, I may end up getting the card again sometime soon. After all, I technically never got the bonus on this card, since my bonus was on the U.S. Airways card before the conversion. Stay tuned for Keep or Cancel: Part II where I’ll show examples of cards we recently decided to keep. I will explain what went into the decision and I’ll show just how much value we reaped from these cards to make them worth the annual fee. This entry was posted in American Airlines, Barclaycard, Citi, Credit Cards and tagged AAdvantage, Aviator Red on June 12, 2017 by Gomanson. The last weekly update mentioned I was going to do a mini app-o-rama. I applied online for 2 cards that night: the CitiBusiness Platinum Select American Airlines AAdvantage World MasterCard (what a mouthful! ), and the Chase IHG Rewards Club card. I’ll post full reviews of each card later, but for now I’ll just mention each card’s bonus offer. Boooo… No one likes to get the “Application Pending” message. It’s so anticlimactic compared to the “Congratulations! You’re awesome enough to get our great rewards card! Great job, sport!” message you get when you’re instantly approved. Alas, I got two ‘pendings’ so I called both reconsideration lines the next day. I got through to a live person with Chase after 1 ring. After I asked about the application he quickly put me on hold so he could find someone to review my app. When he came back after 3 minutes and told me to hold again I asked him if my total credit limit with Chase was the reason my application was pending. He said it was over the limit he’s authorized to approve, but he had recommended a credit increase (meaning I would get the new card) based on my credit report. Before he could get me on hold again I asked him if he could just transfer some credit limit for the new card from one of my existing Chase cards. He quickly told me that it would work, he asked which card I wanted the credit limit transferred from and how much, and put me on hold to finalize it. When he came back after another 3-4 minutes the application was approved, pending identity confirmation. He added Rachel to the call (same person I talked to last time I needed to verify my ID) and after a few questions she verified that it was really me. Everything went quickly, smoothly, and most importantly, the way I wanted it. I’ll chalk this call up to another example of Chase’s excellent customer service. The next call was to Citi’s application status hotline. After hearing that my app was still in process, I followed the prompts to speak to customer service. This may have been a mistake since I already had a direct phone number to the CitiBusiness recon line. I think all I got for my laziness was an extra 20 minutes on hold. When I finally got a real person on the line, it went very smoothly. He checked on my application and verified my income and identity. After 2-3 minutes on hold he informed me I was approved and would get the card in the mail within 5-7 business days. It arrived a week later (today). Overall the Citi customer service was good, but the hold time was annoying. Why only 2 card applications, bro? Good question. A friend of mine questioned my choice and number of cards for this latest round, and I don’t blame him. Conventional wisdom says “App 3 cards; make each app-o-rama count, son!” While I usually agree with that wisdom, there are several reasons for my decision to only get 2 cards this time around. We may be applying for a mortgage or mortgage pre-approval within the next few months. While my high 700s credit score probably won’t suffer enough to make a difference on a loan application, I don’t want to push it. My logic may be a bit off, but it makes me feel better to tone it down a bit for the time being. There are no *spectacular* offers out there at the moment. All the standard “good” offers that are available right now are already in my wallet or in my safe. And the really good cards I still have yet to get (Chase Hyatt, Southwest Rapid Rewards to name a few) don’t fit into my timing strategy at this point. Overall, this nice little app round gets me 50k AAdvantage miles (currently my favorite airline miles) and [at least] 70k IHG points, which fills a weak point in my overall points and miles portfolio. Stay tuned for more details on the offers, as well as full reviews on my new cards! In the meantime, here are the links to the flyertalk wikis for the cards in this post. The wikis contain links to the card offers; and the most recent forum posts contain data and reports on people’s recent applications and bonus offers. This entry was posted in Chase, Citi, Credit Cards, My Story and tagged AAdvantage, IHG on April 7, 2015 by Gomanson.